This weekend was a quiet one for me. With Thanksgiving at the end of the week and a trip to California next weekend, I figured me and baby could use the rest. Saturday I mostly lounged around in yoga pants, so I didn't feel that outfit was anything cute enough to post. On Sunday I was still lounging, but I decided to dress up my comfy house look a bit. I didn't get a chance to post a bump update last week, so here's my baby bump update for this week. 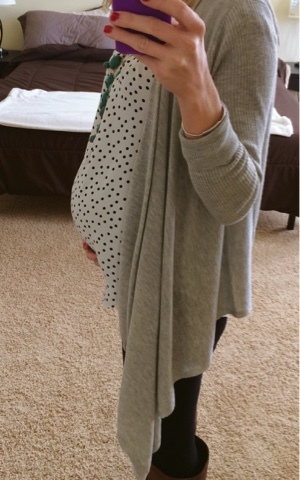 It feels like my belly is huge, but when I look, I realize that there is still a lot of room for him to grow. I've been pretty uncomfortable lately, but I'm trying to stay positive and enjoy this whole experience. I still have 3 whole months to go. I guess no one ever said it was easy to grow a human. Have a great week and enjoy your Thanksgiving!